Mix the onion powder, nutritional yeast, soy sauce, maple syrup, vegetable oil and liquid smoke. Pour over tofu slices and marinate for a few minutes. Place tofu slices on a lightly oiled baking pan. Serve on bread and top with vegan mayonnaise, tomato slices and lettuce. Looks Yummy- I will try this ! Thank-you ! This was one tasty sandwich! I have left over “bacon” for breakfast too! I added Avocado and Jalapeños. I cooked my Tofu a bit longer cause I wanted it very crispy. Making this today. Thanks for sharing the recipe!! Not mentioned in the video, but probably helpful is to drain the tofu before hand. Either use a plate and a can of veg, or whatever you have. Set it on the counter for about 15 minutes or so. I made this and no matter what I did, I ended up with tasty slices of soft tofu. minutes , I turned the heat down to around 200 and kept the tofu in the oven till it was very dry. It was great! Love the simplicity of your recipes. Thanks!! Very good. Great if your just starting to use tofu or if you want to try it again. I replaced liquid smoke with maybe a tsp of paprika, and put cornstarch on the tofu before putting it in the sauce to make it more crispy. Amazing recipe. I served my with Dave’s Killer Bread, L, T and a chipotle mayo. This was so good. I would not change a thing. Generally a really successful recipe- however there are two major flaws. First of all, 450g of tofu is a LOT of tofu, and the marinade definitely would not cover this much. Second, as others have mentioned, the tofu absolutely must be pressed and/or dried in order to get even somewhat crispy “bacon”. I recommend omitting the maple syrup (cut unnecessary sugar) and adding cumin, tumeric, and black pepper. One of my favorite recipes! I tried this but used baking powder instead of yeast because I forgot to get yeast and onion powder. And I don’t know what I did but it came out badly. I had the tofu out and got the water out of it but it tasted like rubber and it was gooey. What did I do wrong exactly? Was it the lack of yeast? If you use gluten free bread! I have made this several times and the flavor is delish. However, even though I pressed the liquid out of the tofu, I could not get it to crisp up, had soft tofu strips instead. I will try lowering oven temp and keeping in oven till dry or maybe using the broiler after baking it? Also, double the recipe to cover all the strips. I put it on ciabatta rolls wit vegan mayo, lettuce, tomato and sliced avacado. Loved it! This recipe is a keeper. WOW! This turned out wonderful! I sliced the tofu, then put it my air fryer at the lowest temp to dry it out a good bit, but not completely (this could be done in a low temp oven). Then I cut the slices lengthwise to give them more surface area. I followed the rest of the directions, except that I baked it for about 25 minutes. The best strips were the thinnest ones (about 1/16th inch). They got nice and crispy, but were still just a little chewy (not soft) in the middle. The thicker slices were softer, but crispy around the edges and still very tasty. I’ll know to slice it all thinner next time. I came up just a little short on the sauce. I’ll increase it by half next time. BACON!!!!! Hi how long does the tofu last once I make it? I’d love to refrigerate and take out for another day. 🙂 Love this recipe! 5 days, on the fridge! Best tofu bacon recipe i have made yet! Will use the marinade for other stuff too! OMG! This recipe is amazing!!! The BEST T.L.T. EVER!!! However,still turned out tasty,but next time would slice it thinner. Thanks,Buddhist Chef ! what could be an alternate to nutritional yeast? its not available in the country where I am in. You can skip it altogether, it’s very difficult to replace since it has such a unique taste! I love your videos! Thank you. That being said, can the oil be omitted or is it needed to get crispy ‘bacon’? Oh, and for those who can’t get nutritional yeast you can order it on Amazon. Try KAL (non-GMO) nutritional yeast. It’s where I get mine. Hope this is helpful. This sandwich was just delicious!! We love Tofu! I love this recipe! What about marinading the tofu overnight? Would that make a difference? The tofu bacon is amazing! I did press my tofu for a while and I baked it for 35 minutes. It’s nice and crisp, and tastes very much like the “real thing.” Really delicious on a sandwich. Just made this – absolutely delicious. I made this tonight, we were pleased with the results and will try it again soon. Instead of liquid smokeI used a small amount of Tabasco sauce with chipotle. I read some of the comments and I would like to try to get crispier tofu by draining the tofu first and dusting with some cornstarch after the marinade has been added. Some other comments regarding quantities: I used half of the tofu quantity specified, with all the sauce. I found it a little sweet, so I’ll reduce the maple syrup next time. A very tasty meal, thanks for the recipe! I am adding this to one of my top fav recipes. My tweaks are: 1) I double the marinade recipe and add maybe 1 T of water to thin out a little; 2) I bake on parchment paper and skip putting oil on pan; 3) I start with extra firm tofu and slice thin — I didn’t worry about super thin but did make fairly thin…then I laid slice out on paper towels for about 10 min to dry a bit…and patted dry, slight pressure with paper towel to get moisture out. You could skip the 10 min dry and just press on tofu slices. 4) I baked for 20 min at 375 and then another 10 min at 250. End result good with some chewy parts and some crispy parts. This recipe is flexible with flavors. I made 2nd time using brown sugar instead of maple syrup. I’ve add paprika (smokey flavor). Could try tiny pinch of cayenne, some garlic powder, etc to mix up flavors. Thanks for a great recipe. I have made this several times now. My wife and I use it for BLTs and my daughter just gobbles it up as soon as it cools down enough, no bread, lettuce, or tomatoes getting between her and her “bacon”. Thank you for the amazing recipes. I was raised on a cattle farm in the 70’s and just watched What The Health. I am going grocery shopping tomorrow, and there will NOT be any meat in my cart. This is my 2nd time making a tofu recipe of yours and the 2nd time I’ve demolished one of your tofu recipes. Way to go! There may be hope yet with tofu! I am new at this. How do you press Tofu? I am obsessed with this recipe! Double the marinade, slice the tofu a little thicker, and bake just until browned, then serve it over coconut Basmati rice with a side of spicy mango or peach chutney. Or do a slaw with radishes and kale and whatever summer veggies are on hand. Glorious. Great movie! ‘Love the effect it had on you, Kimberly! Welcome to delicious, healthy, cruelty-free eating! I’m making this tonight the way it was written (just pressed the tofu a bit). I was just wondering if it would work using frozen and defrosted tofu for a different, crispy-chewier, “bacon-y” texture? Love this recipe. My teenage omni son is very dubious of my attempts to feed him “veganny” foods and even he agreed that this was delicious. I have made this recipe a million times now, so I thought I should comment! This is by far one of the EASIEST and TASTIEST ways to prepare tofu, if not THE easiest and tastiest way! I have started making it in my air fryer instead of the oven; it’s very fast, and gets the tofu nice and crispy without adding any extra oil. Thanks for posting! Loved this recipe, can’t get liquid smoke here in ireland so used smoked paprika. Was fab!!! I love your site….and I made this tofu bacon a few weeks ago. It turned out great even though I’m not the world’s greatest cook. Thanks so much….!!! It crisps up pretty well in an air fryer. You could add just a teaspoon of oil for a bit of greasiness. We have a travel trailer and I would like to make a big batch for the road. How long will this keep refrigerated? Have you frozen it after cooking? It should keep for 4 days! It works! Now I love tofu! Cooked it a little longer, and used a smaller package of tofu. I had no liquid smoke cause I live in a Yorkshire village. May find it when next in York. Loved your broccoli and crispy tofu recipe as well. Thank you for improving my diet at 74! You can teach an old dog new tricks! This recipe is so easy and yet the result so incredible!! Thank you for sharing this one 🙂 Can’t wait to make it again, for Fathers Day tomorrow for the family. I just made this , its was fantastic !! I have leftovers for tomorrow ! So happy about that. I’ve made this many times. We love it. It’s a great alternative. I’m so damn hungry, I just realized I have everything I need and I’m making this RIGHT NOW. 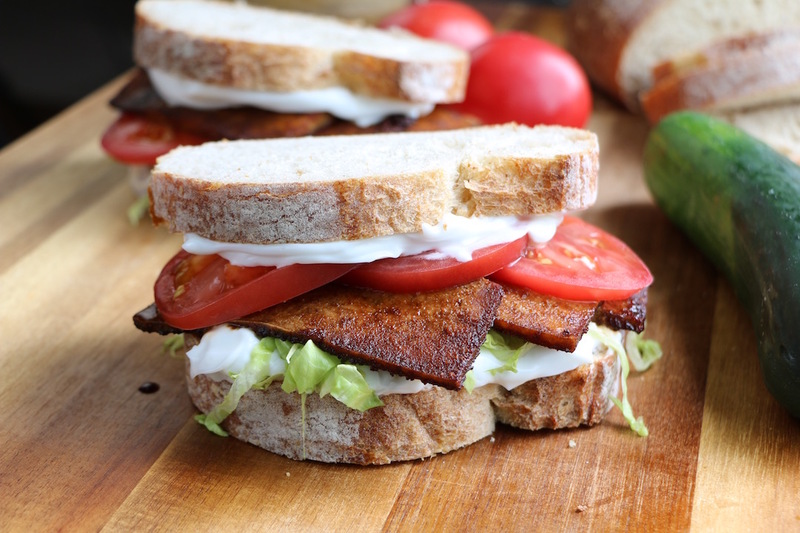 Almost all of BC’s recipes have versatile ingredients and this tofu bacon is no exception. The sandwich is bomb, the bacon is bomb in burritos and any sandwich, really, but don’t expect it to traditional bypass surgery bacon. Hi… will it taste the same without the oils, as I can’t have oils?